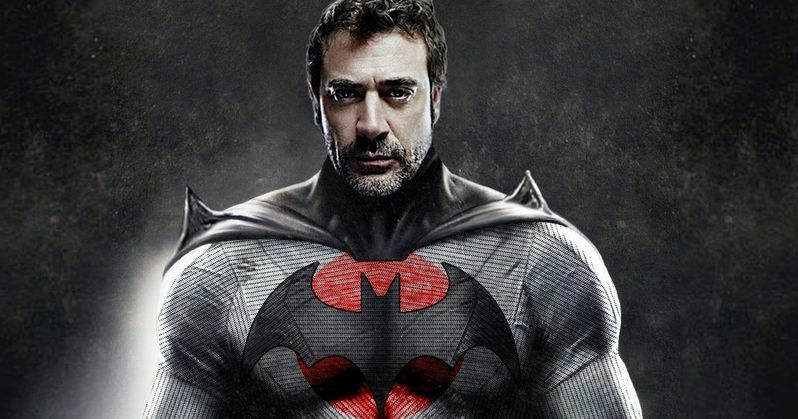 Jeffrey Dean Morgan has once again expressed his desire to portray Batman in the Flashpoint movie and many fans believe that this has to happen. It seems that everybody wants to hop in and play the Caped Crusader these days with Jake Gyllenhaal and Jon Hamm bidding to take over Ben Affleck in Matt Reeves' The Batman and Morgan publicly teasing about his role in Flashpoint. There have been rumors that Affleck will stay on for Flashpoint, but that doesn't really make any sense since Bruce Wayne is killed off in the storyline unless he stays on for flashbacks or the very beginning of the movie. Comic Book reports that during a recent panel at Walker Stalker Con in New Jersey, Jeffrey Dean Morgan spoke up about his hopes of returning to the DCEU, saying, "There's a role in the DC Universe I've got my eye on". It quite obvious what DC role that the actor is referring to, which is Flashpoint's Batman. Morgan expressed his excitement over the summer when the project was announced and then the actor kept really quiet about the whole thing while appearing on the Jimmy Kimmel Live show, dodging any questions having to do with the Dark Knight. The Flashpoint storyline was written by DC's Geoff Johns and tells the story of Barry Allen traveling back in time to try and stop the murder of his mother. When he returns to the present day, he finds that his mother is still alive but the world is an entirely different place from the one that he initially left behind. The alternate reality is not a pretty one, the Justice League no longer exists and most importantly here, the robbery of the Wayne family takes an interesting twist as Bruce Wayne is murdered instead of his family. Ultimately, Thomas Wayne becomes Batman and Martha Wayne goes insane and later becomes the Joker. The DCEU is in a bit of a transition period after the perceived failure of the Justice League movie. It had been rumored that the fate of the future of the DCEU sat on the shoulders of Justice League and now that rumor appears to be true. Warner Bros. is in the middle of some major rearranging for the future of DC movies. Flashpoint is still in development and is now being looked at as the game changer for the DCEU, much like it was for DC comics when it came out and changed the landscape. While there are still many hurdles to overcome, Jeffrey Dean Morgan has already played Thomas Wayne in Batman v Superman and he is the logical choice for the role in the Flashpoint movie. Basically, nobody really seems to know what's going on, but Morgan might have some more information than others and either already has the role or he has one of the most exciting campaigns ever seen for the part of a movie. While we wait and see, go check out what Jeffrey Dean Morgan had to say about that certain DC role via ComicBook.com.